These two were enjoying their courtship today on my patio. 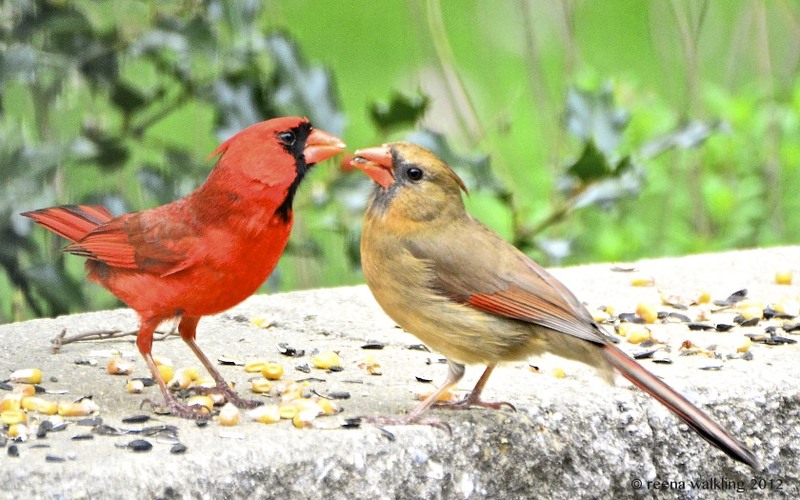 As I understand it, Mr. Cardinal will court his future mate by feeding her seeds. I guess I'm making his job easy by providing those seeds. Do you think she's aware that he's a slacker food hunter?? Oh, sweet spring ... love blooms! I best be stocking up on seed so he doesn't ever disappoint her. There'll be lots of youngin's to raise yet this summer! oh how sweet is that! 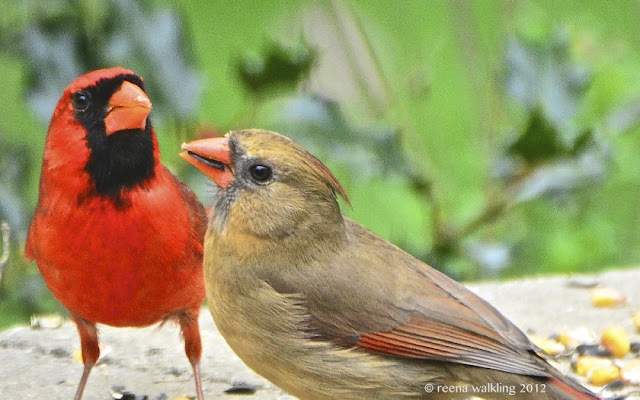 We've been noticing our cardinals doing the same thing. Very sweet shots here, Reena. And welcome home! Beautiful captures, so sweet. It will be great fun for you to watch them and their little prospective family. 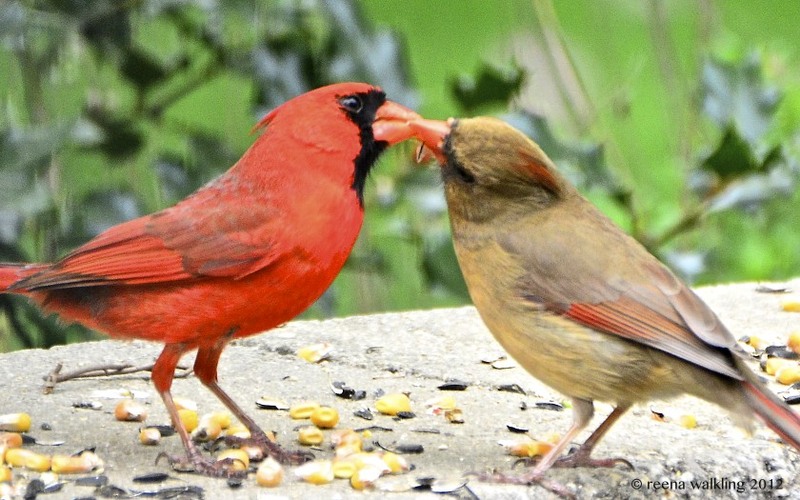 It's quite a romantic relationship they have... and cardinals mate for life. Isn't that sweet? Doesn't get any sweeter or more beautiful than these! How delightful! I look forward to seeing the new family!! Thanks for sharing the love and the fun!! That is too cute, great captures! yesterday, hubby and i were driving down the road (i was riding and looking out the side window) when all the sudden hubby gasped. he said that two cardinals flew across the two lane road, one made it, but the other was hit by a car (he saw it happen in the rear view mirror) and the one that was hit, immediately dropped to the road and was flapping its wings. i'm just glad i didn't see it! You just get the neatest pictures.... I love the last one!! Must be love in the air. :-) Great shots. What crisp clear photos! We love to watch the birds...they are always entertaining especially when the babies come and flutter for their food! Such a romantic series of images! There is such a sweetness to this pair. Well done, Reena! This is SO sweet!! I have seen this happen before, but never gotten pictures of it! So good to be able to see and also record beautiful moments like that between the two birds. Great work! Looks as though he is caring for her well. what great detail. i can see the expression on their faces. we are right in that action. that telephoto gives a beautiful, soft green background. Fascinating! I didn't know they courted that way. Hi Reena ...a few men could take lessons form that tender moment ..what awesome photos you got!! How sweet! You captured the moment perfectly! awwwww!! this is so sweet! it's so nice of you to post your birdie photos. I was not aware this is how they courted. This is a great sequence. She looks like she's smiling. Beautiful series. I agree with Margaret, she's just looking at his body. 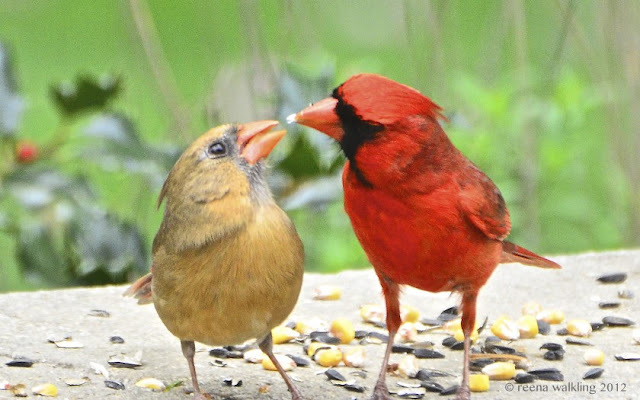 I was just thinking that he needs to rent space in one of your birdhouses so he can always sate his lady love ..courtesy of you! so precious. WHAT? no diamonds to court with, just seed? That sweet moment must be belonged to only two, and you are the third. 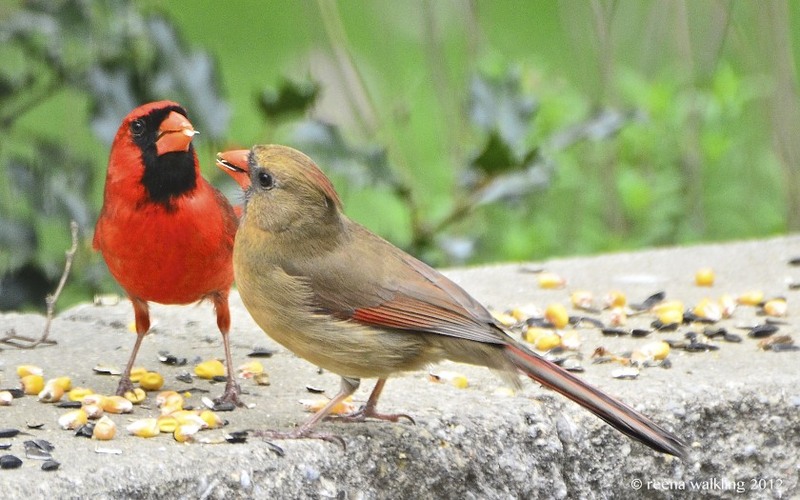 I am not a cardinal expert, but I often see the males feed their juvenile's at my feeders. These birds look about the same size, so it is hard to be sure. But the female's face is not yet black, a sign that she is not yet an adult. I LOVE to watch the father's take good care of their babies. It is certainly still a love story, just maybe not a romantic one. Watch to see if mom is watching too and you will know for sure. These photos are fantastic. You really captured the moment. Awwww. These photos just make me smile. So darn cute!! Reena as if you don't have enough hats to wear already you add Matchmaker to the stack. Your hat rack runneth over. What absolutely wonderful shots. I love cardinals..they are our State bird and Mr. Cardinal is my fav color. How cute they are. Your photos are wonderful. 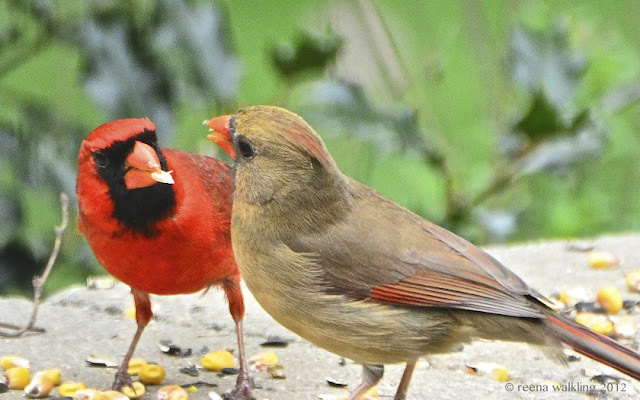 It's the bird version of " Let me buy you a drink." He may be a slacker, but I think she's enamored! Lovely series, serious ahh.......... factor. Aww, that is so cute! Yes, you better stock up on seed, these two lovebirds are gonna need it! oh now are these fabulous shots or WHAT!!! toooooooo sweet! and I just LOVE those red birds...we don´t have them in Germany...tooo bad. Maybe the next time I am in the States I should smuggle a few back with me...ooppps did it say smuggle....but we need some Cardinals over here. So funny! He is a slacker cardinal. LOL! These are incredible photos, Reena. Simply amazing. I love that cardinals mate for life and return year after year to the same breeding ground or overwinter there. A lovely couple, great captures! Reena, you might need more seed when they start feeding their babies too. And maybe a cowbird thrown in as a step-baby. I loved the photos, have a great weekend! Very cool photos! 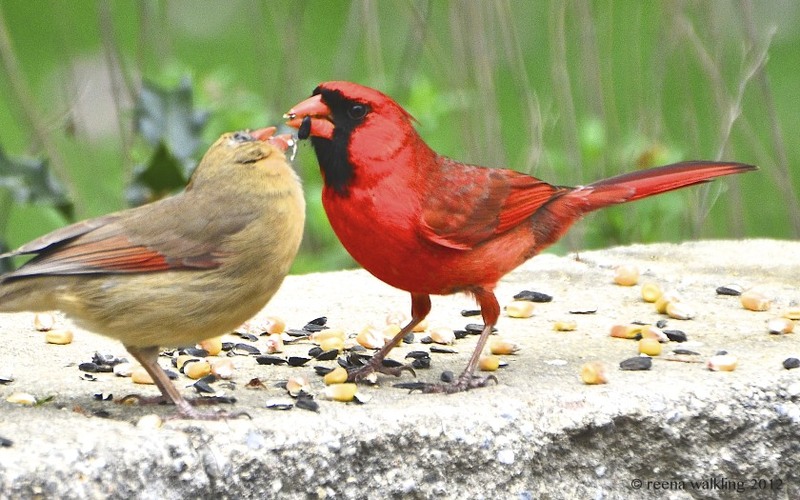 I saw a pair of cardinals doing the same thing today at my bird feeder, and posted it on my blog. This is the first year I have even noticed these birds doing this little ritual. I'm in upstate Ny and I dont have any cardinals yet. I have tried for years but cant get them to come. Love them and would love to see them in my yard.